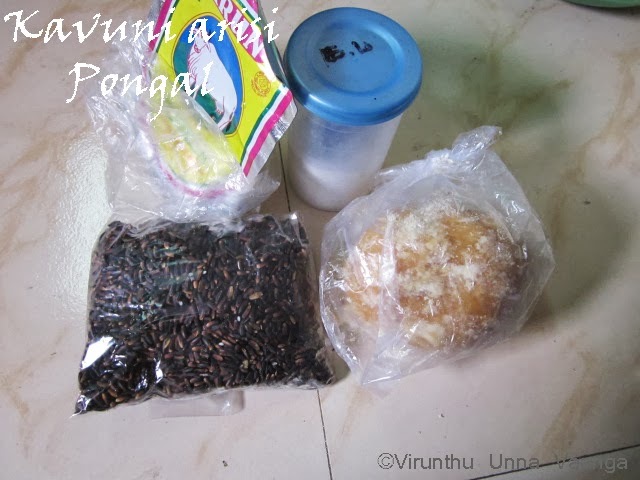 VIRUNTHU UNNA VAANGA: SOUTH INDIAN BREAKFAST THALI - KAVUNI RICE PONGAL - VIRTUAL BIRTHDAY TREAT FOR MANJU!!! SOUTH INDIAN BREAKFAST THALI - KAVUNI RICE PONGAL - VIRTUAL BIRTHDAY TREAT FOR MANJU!!! gathering experience and accumulating life skills. My Birthday wish for you is that you should grow wise not old. I wish you a very joyous Birthday!!! She is celebrating her birthday… She is very humour, fun loving, and down to earth girl. We are become friends through SNC chat, after that we have talked often in FB. But for past 5-6 months, we become very best friends. She is always fun loving and am damn sure everyone will be so happy if she around us… She is very energetic person who makes many recipes at the same time and I admired her energy a lot and that energy pass on me to this yummy thali for her... Am the one who is in her circle and lucky to have such a lovable friends in my life. This was my first thali preparation, Thanks Manju, I really very happily made the thali for you, and in the name of you we enjoyed the entire platter. 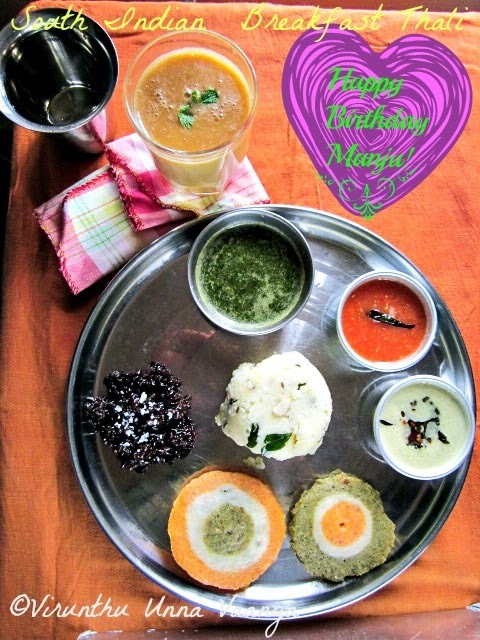 SOUTH INDIAN BREAKFAST THALI FOR THALI QUEEN MANJU DEAR!!! 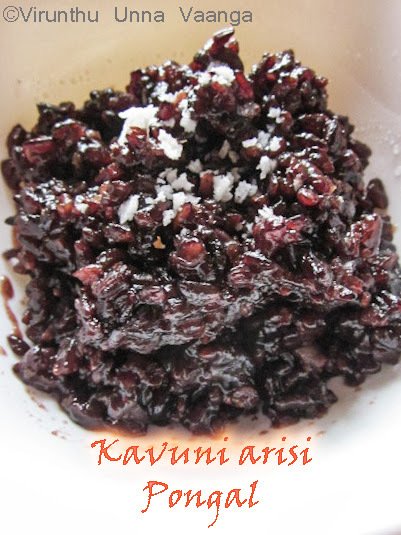 Black rice (Kavuni rice) is a range of rice types, some of which are glutinous rice Black rice is high in nutritional value. The grain has a similar amount of fiber to brown rice and like brown rice, has a mild, nutty taste. In China, black rice is claimed to be good for the kidney, stomach and liver. 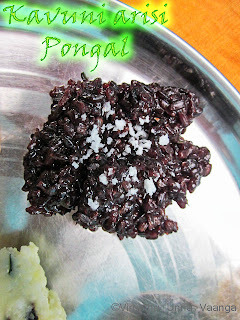 Black rice is a deep black color and usually turns deep purple when cooked. 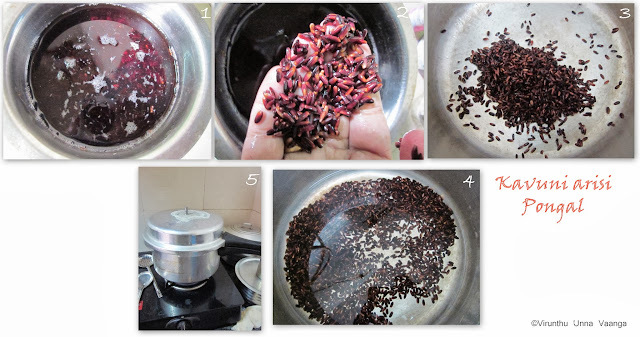 Its dark purple color is primarily due to its anthocyanin content, which is higher by weight than that of other colored grains but more limited in the number of different anthocyanin species present. 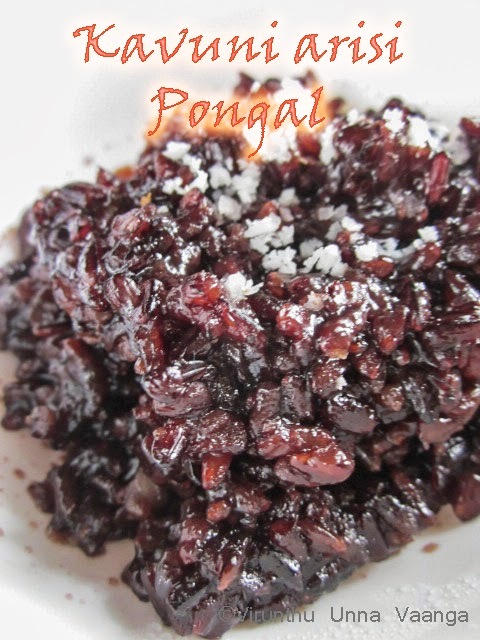 It is suitable for making porridge and it can also be used for making dessert, traditional Chinese black rice cake or bread. Black rice offers all of the same health benefits of brown rice but it also packs some serious antioxidants. Because of its dark color, black rice bran contains the same anthocyanin antioxidants found in blueberries or blackberries. 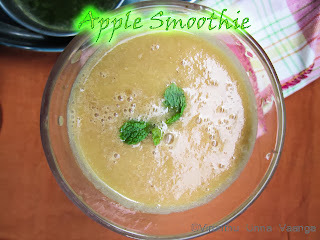 Less sugar and more fiber and vitamin E antioxidants. For fighting heart disease, cancer, and other diseases. 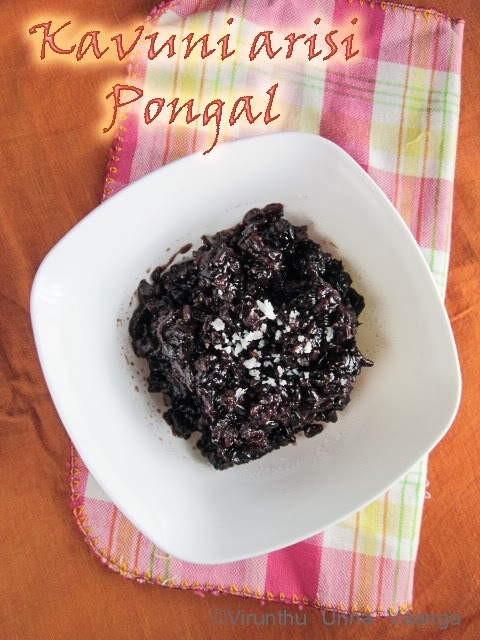 The bran or hard outer shell of the black rice is the part with all the great benefits but it also makes the rice a little tricky to cook. More healthy than brown rice. Soak the kavuni rice for 12 hours or overnight. Then wash and pour water (1:6) to the rice and pressure cook it for 5 whistles, then switch the flame to low for 20 minutes. 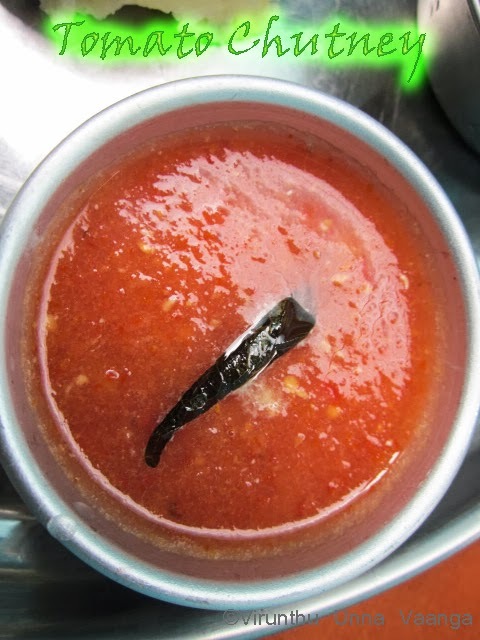 Meanwhile prepare jaggery syrup, take the jiggery in a bowl add 1 Tbsp of water and melt it and switch off the flame. After pressure reduced, mash the rice with ladle, then filter the jiggery syrup and pour the syrup into the rice with cardamom powder. Add ghee and mix it well and cook it for 5-10 minutes and switch off the flame. You can substitute jaggery with sugar. 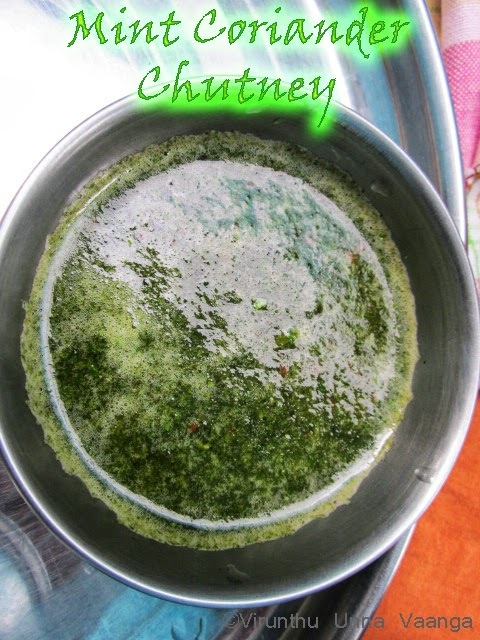 If you need rich flavour add ghee roasted cashew nuts. Grated coconut can add to this mixture. 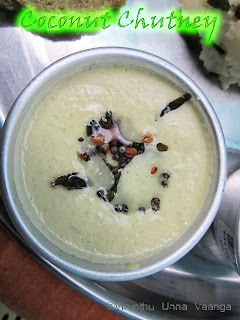 When it’s cold, it taste awesome if you keep it in refrigeration avoid adding grated coconut. 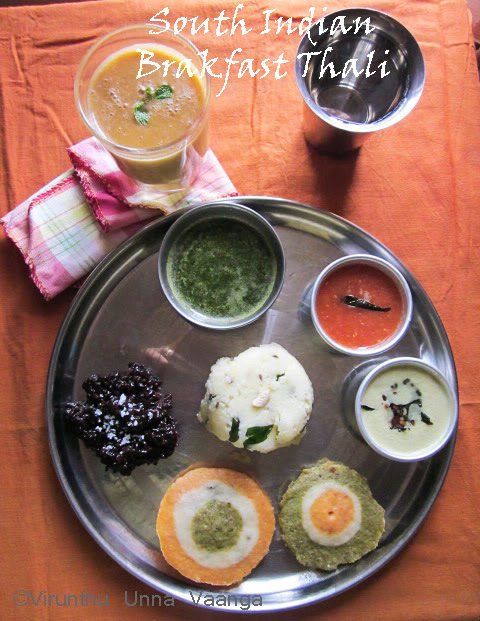 DELICIOUS, HEALTHY AND FILLING SOUTH INDIAN BREAKFAST THALI!!! HOPE YOU LOVE IT MANJU!!! 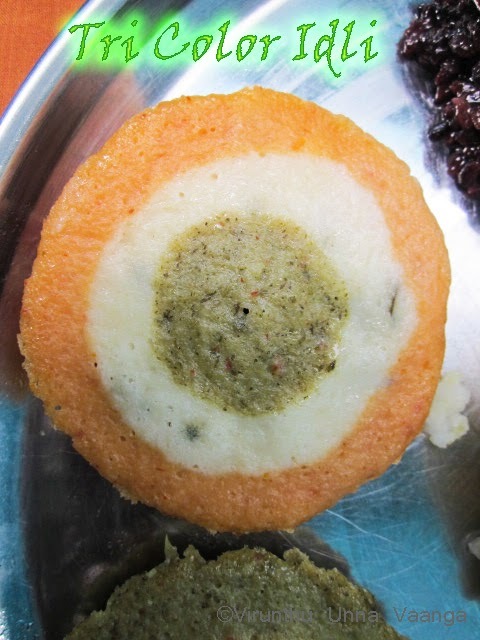 Omg, u makes me hungry sis,that too that kavuni arisi pongal,i can die for it..Wonderful thali,especially that tri colour is just breath taking. 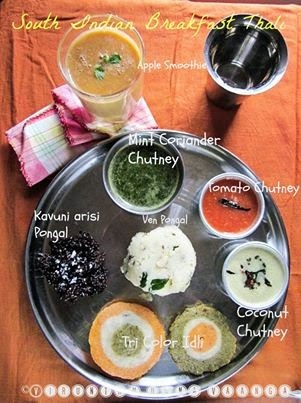 Thali looks so colorful and healthy. Delicious thali. Visit me too pl. Omg such an droolworthy and very very heathy breakfast platter !! tempting me a lot and can't resist sitting here and only looking at the temping clicks will run and come to your home for this yummy eye appealing platter :P :) You guys made me so spl today am so so impressed seeing you efforts you have take to surprise me :) All the dishes looks so so colorful and yummy :) The tri color idli , the healthy kavuni rice , very delicious looking venpongal and the 3 colorful and tempting accompaniments make me drool !! :) am so happy to find you in this huge blogging world . You have been so so kind hearted and nice person who showered me with lots of encouragement :) thank you so much for this grand feast viji :) Hugs !!! 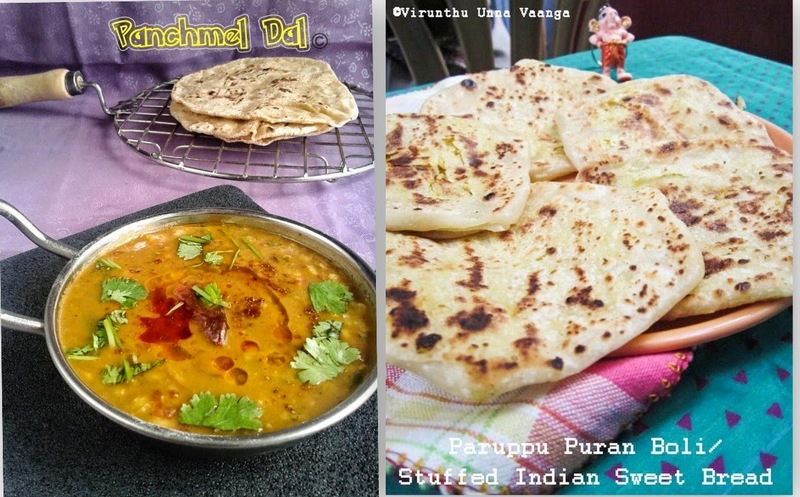 Wow viji, u have done a nice job, these days i am too busy to check other blogs or even not able to post any recipes. 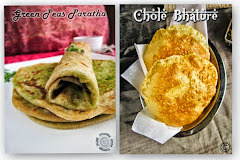 but today when i visited ur blog it seems you are on roll :). Good efforts. 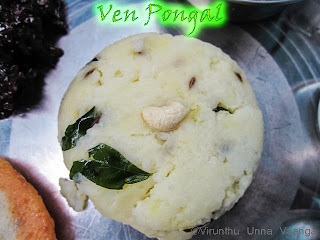 But kavuni is new to me...Brown rice and kavuni or nelmaavu arisi all are same ah? Hi mymoon, thanks for your comment. No, brown rice and kavuni rice s different... Kavuni rice will be in black color n they tell black rice too... Kavuni rice s famous in Karaikudi Cuisine. When I soak and rinse, I find the water used turns brownish / purple in color. 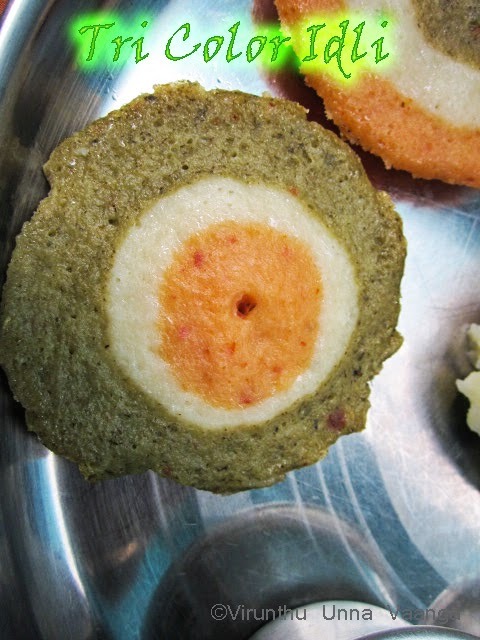 Is it natural or the rice could have been coloured ?